‘Me? Why?’ Tren climbed up the back of the seating that ringed the field, perching himself at the top. Ed fell silent as he climbed up behind him, didn’t speak again until both were seated side-by-side, watching the game over the heads of the crowd. ‘You spend a lot of time together,’ Ed said at last, in a neutral voice. ‘Mern’s not interested in me,’ Tren said with some surprise. How had Ed got that idea? ‘Rubbish. Oh, that’s Karan Reed,’ he added, his eye settling on a tall dark-haired girl standing out on the edges of the pitch. The two teams on the field were both of mixed gender; he recognised one as the current official team of Glour City’s Sorcery Academy, though he didn’t know the other. Glowball was a sorcerer’s game. Somewhere out on the pitch was a single tiny light-globe, powered by sorcery. Its light came and went intermittently; when unlit, it was essentially invisible on the darkened field. The players had to use senses other than their eyes in order to predict the erratic path of the ball – and intercept it. For a few seconds there had been that hush that fell when the unlit glowball evaded the efforts of both teams to locate it. The players came to a temporary halt, all thoughts and senses bent on discovering the ball. Then Karan Reed had begun to run; she leaped, just as the glowball flared into blazing life. Her fingers closed around it and she was away, sprinting for the scoring line at the end of the field. The other players charged after her, her own teammates defending her from the opposition’s attempts to tackle. Tren held his breath as he watched her flying down the field. Three times she was nearly brought down; three times she twisted away with glorious agility and ran on. She made it; the crowd roared as she crossed the line, the glowball still blazing with light in her hands. Green light flashed over the pitch, signalling a point gained for the Academy Team. Tren applauded with the rest of the spectators, whistling his appreciation. Karan Reed must be close to graduating; she’d be a fearsome sorceress once she finished her training. Probably she was already on the Chief Sorcerer’s recruitment list. ‘Someone needs to stay and cheer on Reed,’ Ed replied. ‘On your behalf, naturally.’ He said it lightly, but something in his voice and manner sounded off. Tren paused. He’d frequently had the sense lately that Ed wasn’t quite himself, but his enquiries were typically brushed off. ‘Good point.’ Tren vaulted off his perch, landing with practiced ease. He had to pass one of the city’s largest bulletin boards on his way out of the gaming fields. The thing was enormous, displaying its rotating schedule of images and articles at such size that one couldn’t help but be caught by it. Tren tried to avert his eyes as he approached, determined that this time he wouldn’t make an idiot of himself by looking for one particular face to flash up on the board. Fate betrayed him. There she was already, almost as large as life. Lady Evastany Glostrum, pictured at some high society event. Her hair – the rare, true-white hue only occasionally seen among Glour’s citizens – was elaborately arranged and decked with jewels; her dress was velvet or something, dark red like blood. Tren stopped, all thought of the Night Cloak emptying out of his head. He had never met Lady Glostrum in person. He was a powerful sorcerer and naturally therefore he had a good job, so he wasn’t poor by any means; but that didn’t come close to putting him on a level with the realm’s aristocrats. Maybe that was why she fascinated him. She was a popular figure, and chief of the realm’s Summoner organisation along with it; her image regularly appeared in the city’s bulletin news, and even more regularly in the gossip papers. He’d never seen her looking anything but perfectly composed, perfectly arranged and perfectly beautiful. Could she possibly be so glorious in person? Doubtful, he told himself sternly. He allocated half a minute to absorbing this new image of her ladyship – he didn’t have time to read the article – and then he turned his head away and continued on. The Night Cloak wouldn’t wait any longer. The Chamber was guarded, of course, but he’d been on this job for more than a year; they all knew him by now. ‘Thanks,’ Tren said. He made his way through the building to the centre where the Chamber itself was situated. The room was a large, oval shape with a high, domed ceiling. It was not lit, except by the gentle glow of the realm map that was traced through the air near the floor. Tren stepped up to it, casting his eye over the familiar contours of the realm of Glour’s borders. He glanced up. The dome and most of the walls were clear, allowing him an unimpeded view of the night skies. The moon hovered close to the horizon, and the sky was turning paler. Pausing to collect his thoughts, he took a few deep, slow breaths. When he felt properly centred and in control of himself, he began. He walked around the perimeter of the insubstantial map, his steps unerring though his eyes were closed: he saw the construct in his mind’s eye. He conjured shadows, dismissing all hints of light. Working fast and skilfully, he wove the darkness into a shroud, pulling it into place over the map. He felt the pull of energy as the wider enchantments mimicked his localised efforts, building a vast Night Cloak over the realm. It might be one of the most complex workings ever designed, but it was the work of a mere few minutes to put it into place. He paused, gasping for breath, as the Night Cloak crept over Glour, blocking out all hint of light from moon and sun alike. He waited, willing it to move faster. It was imperative that the Cloak was in place before the sun rose; Glour was a Darklands province whose society and economy relied on the nocturnal plants and beasts imported from the ever-shadowed Lower Realms. An influx of strong sunlight would burn all that away – not to mention blinding the eyes of its night-loving citizens. Serves me right for being distracted, he thought ruefully as the Cloak continued its agonisingly slow descent. He watched anxiously as the skies continued to lighten outside. It was Karan Reed that was the trouble; she was too absorbing to watch. A small internal voice interrupted that train of thought. Was it fair to blame it all on the game? Had he not stopped again on his way out of the sports field, arrested by a mere bulletin board image? That red gown… it was the red that had attracted his eye, definitely. A strong colour, difficult to overlook. Not really his fault. He laughed silently at his own attempts to excuse himself, relief flooding him as the Cloak’s activation sequence concluded and full darkness covered the realm. Then he frowned, suffering a twinge of alarm. The darkness wasn’t as complete as it should have been; something pulsed oddly in his mind’s eye, some anomaly in the Cloak’s weave. He withdrew from his mind’s view, opening his eyes. The Chamber was red. Dark red light stained the walls and floor, stained the white hands he raised in panic. Looking up, he saw a dark red sky. Not the red of cherries or even of lip paint, but the sinister dark red of blood. His heart sank as he realised. Red like Lady Glostrum’s gown. He’d allowed his thoughts to wander while he summoned the Cloak, and that was the image that his absurd mind had conjured for him. Dark red velvet. He swore, letting several precious seconds pass by in blind panic. He’d turned the damned Night Cloak red! The whole bloody realm was swimming in blood-red light; not bright enough to damage anything, he hoped and prayed, but certainly wrong enough to be seriously alarming. Tren shuddered. The Chief Sorcerer’s voice really did carry impressively. ‘Er,’ he stuttered. ‘Not quite sure, m’Lord.’ He tried not to look up as the imposingly tall figure of Lord Angstrun strode into the room, not caring to experience – again – the look of pure fury that no doubt dominated his boss’s face. Tren scarpered gladly enough. He hovered out of the range of the map as Lord Angstrun fell into the working-trance. Whatever he did was effective: the alarming red light drained steadily away until normal Cloaked conditions returned. Tren allowed himself a small sigh of relief. ‘I’ll say,’ Angstrun snapped, turning suddenly. ‘If you weren’t such a damned good sorcerer I’d turf you out for that without a second thought. What exactly was going on in there?’ He jabbed a finger at Tren’s head. ‘Um…’ Tren hesitated. He could hardly explain, not without making himself look like even more of an idiot. ‘I don’t know, sir,’ he said lamely. ‘Thank you, sir. And um, sorry.’ Tren exited quickly, before Angstrun could change his mind and decide to flay him or something. Tren was halfway down the corridor when Angstrun called after him. This entry was posted in Fantasy, Featured Authors, Short Stories and tagged Charlotte E. English, draykon, Fantasy, Lady Evastany Glostrum, Pitren Warvel, Short Story. Bookmark the permalink. 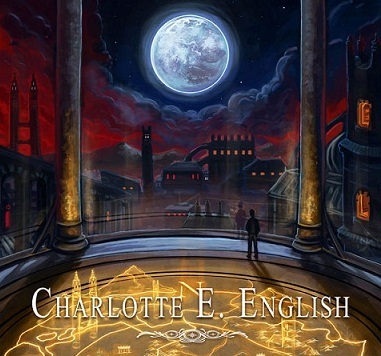 Pingback: Charlotte English Short Story | Home. Love. Books.